French President Emmanuel Macron (C) meets gendarmerie and police forces during his visit in the French northern city of Calais, Jan. 16, 2018. France and Britain will sign a new immigration treaty at a summit between President Emmanuel Macron and Prime Minister Theresa May in Britain on Thursday, French officials said. The treaty will "complement" but not replace the 2003 Le Touquet border agreement, which has drawn criticism in France after the town of Calais became a hub for migrants and refugees on their way to Britain, just 33 km (20 miles) across the English Channel. FILE - The port of Calais, France, is seen June 24, 2016. France wants Britain to provide more money and resources to tackle the migrant flows and has suggested that the Le Touquet accord may have to be ended if a compromise or a new set of arrangements can't be reached. 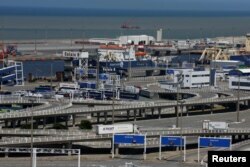 Under Le Touquet, Britain has its border in France and France runs border checks in Britain, a deal that French officials say favors the United Kingdom. Both parties can withdraw from the treaty, which would mean a return to hard national borders. That move that would symbolically cut Britain off from the continent just as it is implementing Brexit. FILE - Migrants gather cardboard to build makeshift shelters near the former "Jungle" in Calais, France, June 1, 2017. 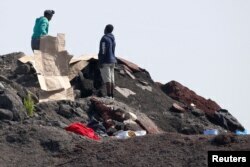 A French official said issues of unaccompanied children, asylum requests, border police cooperation and possible British support to the economic development of the Calais region will be part of the new agreement, which is still being discussed. "We'll boost British financial support to the securization of transport infrastructure, border police and security and we'll raise this question of economic development," the presidential adviser said. Pro-Brexit lawmakers from Britain's governing Conservative Party have dismissed as "absurd" suggestions that London should pay more, saying Britain already provides extra security to France, including border infrastructure.